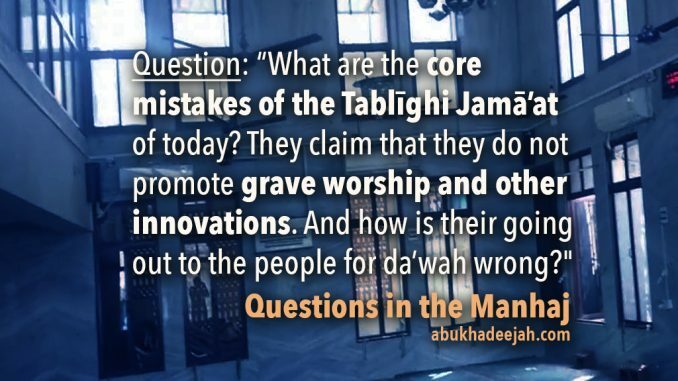 “What are the core mistakes of the Tablīghi Jamā’at? They claim that they do not promote grave worship and other innovations. And how is their going out to the people for the purpose of da’wah wrong? Jamā’at at-Tablīgh, for those who do not know, was founded by Muhammad Ilyās al-Kandahlawi, a Deobandi Chisti-Sūfi. His upbringing was upon the Maturīdi creed , Deobandi school and Sufi mysticism . Tablīghi Jamā’ah affirms this, and it is written in their biographies of him. Muhammad Ilyas deviated in his belief and methodology from the first three generations. He was born in 1885CE and he died in 1945CE at the end of the Second World War. He was ardently loyal to the Hanafi Deobandi movement and he set up his Jamā’at at-Tablīgh based on a dream. The Deobandi  movement is a staunch Hanafi and Sufi school established in 1867CE – they are Ahlul-Bid’ah from among the seventy-two sects of misguidance. Muhammad Ilyās gave his pledge of allegiance upon Sufism to Rasheed Ahmad Al-Kankoohi (d. 1905CE). He took some his sciences of the religion from Ashraf ‘Ali Thanawi, the famous Deobandi ideologue (d. 1943CE). As we stated, Muhammad Ilyas had a dream and, in that dream, the path of Tablīghi Jama’āt was decided for him. Sufis everywhere place a huge emphasis on graves and esoteric practices that have no basis in the Qur’an and Sunnah. It is known that Jamā’at at-Tablīgh and Deobandis venerate the graves of their leaders and they seek intercession from the deceased through adherence to various Sufi orders. These narrations prove the prohibition of taking graves as mosques and places of worship. This is regardless of whether the grave was introduced into the Mosque after building it, or whether the Mosque is built amongst or over the graves. All of this is disallowed by textual proofs. Tablīghi Jamā’ah sect has a source reference book entitled Fadā’il Al-A’māl authored by Muhammad Zakariyyah Al-Kandahlawi. It is a well-known and a widespread book that is translated into different. And it is available in English. This book is filled with fabricated narrations, invented stories of Sufi mysticism, veneration of graves, worship at shrines and innovated types of dhikr and worship. Many of these stories reach the level of polytheism and unbelief! For example, in the chapter Fadā’il Ad-Durūd  they claim that a saint saw the Prophet(salallāhu alaihi wassallam) in a dream saying, “Whoever wants something from anyone should go to his grave and supplicate to Allah for it.”  This is a clear example where Muhammad Zakariyyah Al-Kandahlawi ascribes to Allah’s Messenger(salallāhu alaihi wassallam) that which is not found in any authentic narration. The true religion of Islam and Prophetic hadīth are not based upon mystic dreams – and especially dreams which oppose the authentic texts. Tablīgis leaders believe that it is allowed for a person who requires something from anyone, he should just go to the grave of that person and ask! They believe that when you stand next to a grave, it is likely that your supplication (du’ā) will be accepted. Al-Kandahlawi, reports from another shaikh who said, “I travelled to Madīnah Munawwarah and went to the blessed grave of the Noble Prophet (salallāhu alaihi wassallam). I conferred salutations and heard ‘wa alaykas-salām’ from within the blessed chamber.”  These fabricated stories encourage innovation and are is a pathway to polytheism, that you believe by standing next to the grave of a dead person, Allāh is more likely to accept your du’ā, and that responses are heard from beyond the grave! If that was the case, then why did not the Sahābah (radiyallahu ‘anhum) stand by the graves of each other and make du’ā to Allāh to give them children, or to cure them or to give them victory in Jihād and so on. The Sahābah (radiyallahu ‘anhum) never did this at the graves, and nor the Prophet(salallāhu alaihi wassallam). This is Jamā’at at-Tablīgh and their ideas, and their means that lead to the worship of the dead in their graves, and to polytheism. Muslim reported from Jundub Ibn ‘Abdullāh (radiyallahu ‘anhu) who said, “I heard the Prophet(salallāhu alaihi wassallam) five days before his death saying, ‘Indeed, those who came before you would take the graves of their Prophets as places of worship. Do not take graves as places of worship, for indeed I forbid you from that.’” This is a clear prohibition against worshipping at graves, and he(salallāhu alaihi wassallam) cursed those who took graves as places of worship as is reported in the texts. These types of stories are fabricated by Jamā’at at-Tablīgh due to their esoteric, Sufi and superstitious leanings. It is amazing that these ‘miracles’ seem to befall their pious-ones but were never granted to the Companions of Allah’s Messenger. Muhammad Ilyās Al-Kandahlawi was from the Chisti Sūfī order of India, from Deoband. So, it is no wonder that these fabricated stories (that are a pathway to shirk) end up in their book “Fadā’il Al-A’māl”. They are encouraged to seclude themselves at graves and shrines, perform i’tikāf, speak to the deceased and expectantly hope for a response. They converse with the Prophet (salallāhu alaihi wassallam), call upon him “O Messenger of Allāh, I am your guest tonight.” And then sleep somewhere near his grave. These are fabricated stories! The Prophet (salallāhu alaihi wassallam) never gave bread to his Sahābah (radiyallahu ‘anhum) from his grave, so will he give it to one of their Sūfi saints? The Prophet (salallāhu alaihi wassallam) never gave bread to ‘Ā’ishah (radiyallahu ‘anhā) and she slept in the very room where he was buried. He never gave her a loaf of bread, but he gave it to a Sūfi saint revered by Jamā’at at-Tablīgh?! We seek Allah’s (the Most High) aid from such misguidance. Furthermore, it is from shirk (polytheism) to believe that aid and cure come from other than Allah. How is it possible for a Muslim to think that Allah’s Messenger (salallāhu alaihi wassallam) floats on a cloud seeking out people to help?! These Sufi exaggerations are common within the writings of the Deobandi and Tablīghi movements, and one is astounded at their claims of adherence to the Sunnah. The truth is that Jamā’ah At-Tablīgh is misguidance sect that has misguided and continues to misguide millions of Muslims. Those who are sincere among them will read these few examples and realise the error of this sect. And there are numerous other fabricated and false fables found in their teachings. Their book “Fadā’il Al-A’māl” is filled with fabrications and lies upon the Prophet (salallāhu alaihi wassallam), his Companions (radiyallahu ‘anhum) and the early generations. The author, Muhammad Zakariyyah, cites reports that are barely referenced (if at all) and devoid of chains of narrations (asanīd), in opposition to the way of Ahlus-Sunnah wal-Jamā’ah. Tablīghi Jamā’ah is an innovated group that has led millions of Muslims astray and continues to do so. Here are a few more of the deviations of this sect. Through such narrations, Tablīghi Jamā’ah instil into their followers a notion that their leaders and shaikhs have a special station above and beyond the other Muslims, even above the Sahābah, therefore they are to be followed without question. In fact Muhammad Zakariyyah Al-Kandahlawi stated about these shaikhs who wake up with bread in their hands, or having been fed through the night by the Prophet H such that they can still smell food on their fingers (!) , “One should not question such stories because the basis of these stories is present in the ḥadīths of continuous fasting in which the Noble Prophet (salallāhu alaihi wassallam) said, ‘My Lord feeds me and gives me to drink.’”  Meaning that the shaikhs and pīrs revered by Jamā’at At-Tablīgh are nourished just as the Prophet (salallāhu alaihi wassallam) was nourished! The actual narration from Abu Hurayrah (radiyallahu ‘anhu) states, “Allah’s Messenger (salallāhu alaihi wassallam) forbade continual fasting.” Then he narrated that the Prophet (salallāhu alaihi wassallam) said, “Who among you is like me? Verily my Lord feeds me and gives me to drink during the night.”  This hadīth proves the grave error of this sect in their raising their shaikhs above the Sahābah by claiming miracles for themselves that were not even granted to the best of mankind! The Sahābah (radiyallahu ‘anhum) were informed by the Prophet (salallāhu alaihi wassallam) that they are not like him because he is fed and given to drink by Allah (the Most High) and they are not. So, are the sheikhs of Tablīgh more deserving than the Sahābah such they are granted that which only the Prophet (salallāhu alaihi wassallam) was granted?! These narrations are just the tip of the iceberg. That is why Shaykhul-Islam ‘Abdul ‘Azīz Ibn Bāz, when asked a question about Jamā’at At-Tablīgh founded in India and Ikhwān Al-Muslimīn founded in Egypt, he said that they are from the seventy-two deviated sects, meaning that they are from Ahlul-Bid’ah and are to be treated as such. We do not say that Jamā’at At-Tablīgh are unbelievers. They are Muslims. The question is: Are they not to be warned against? Yes. Should one go out with them? No. Should one seek knowledge from them? Certainly not. Should one read their books? Never. Are they from the misguided sects of Ahlul-Bid’ah? Yes, they are. Imagine if your son or daughter came home with these ideas, and they said that they want to go to Madīnah because they want to sleep next to the grave of the Prophet (salallāhu alaihi wassallam) as his guest so that maybe he will give them a loaf of bread. How would you react to this deviated belief? Or that they want to go and seek to be cured by the Messenger of Allāh H at his graveside or by hoping to see him step out of a cloud to rub their faces and bellies!? Do you want your children to come home with these beliefs? May Allah keep us and our children safe. Bārakallāhu fīkum. So, this is why we warn against Jamā’at At-Tablīgh, it is a new faction founded in the 1920’s. It is an innovated sect and their book is full of fabrications, and I have mentioned to you a just few of them. Some of the scholars of Sunnah declined to do a checking on the book because they said that the checking of the book will be many times larger than the book itself due to the fabrications, deviations and mistakes that can be found in the book. This man, Muhammad Ilyās al-Kandahlawi and the author of Fadā’il Al-A’māl, Muhammad Zakariyyah, introduced numerous deviations and innovations. Muhammad Ilyas was a Chisti-Sūfī from Deoband in India. How can one say that this person is not a person of innovation and that his sect is not a sect of innovation? Yes, they are Ahlul-Bid’ah so we warn against them. We warn against them not because we say that they are not Muslims, but because we wish to protect ourselves and others from their misguidance. And perhaps, this short article may awaken some of them from their trance. We want them to recognize the falsehood that they are upon so that they come to the truth that is with Ahlus-Sunnah wal-Jamā’ah. Followers of the Abu Mansūr Al-Māturīdi (d.333H). He was from the people of theological rhetoric (Ahlul-Kalām) of his era and fell into several deviations in ‘Aqīdah. He held to the doctrine of the sect known as the Murji’ah in claiming that imān is mere belief in the heart, and speech on the tongue – he excluded actions of the limbs from the definition of imān, and held the view that imān neither increases or decreases. He also was heavily influenced by the sects of the Jahmiyyah and Mu’tazilah in holding the view that the Attributes of Allah must be interpreted to mean other than what is apparent if those Attributes did not agree with their intellect and reason. He expounded these views in his two well-known works, Ta’wīlāt Ahl As-Sunnah and Kitāb At-Tawhīd. In Fiqh (the outward acts of worship), Māturīdi was a staunch follower of Imām Abu Hanīfah (d.150H) so followers of Māturīdi spread his ideology under that guise. Over several centuries, Māturīdiyyah became the prominent doctrine in Central Asia, India and throughout the Ottoman Empire. A huge shrine remains till today dedicated to him at Samarkand, Uzbekistan. Tablīghis who pledge allegiance to the amīr (leader) to follow four chosen Paths of Sufism: Chistiyyah, Qādiriyyah, Sahawardiyyah and Naqshbandiyyah. See At-Tuwayjiri, pp. 8-11. 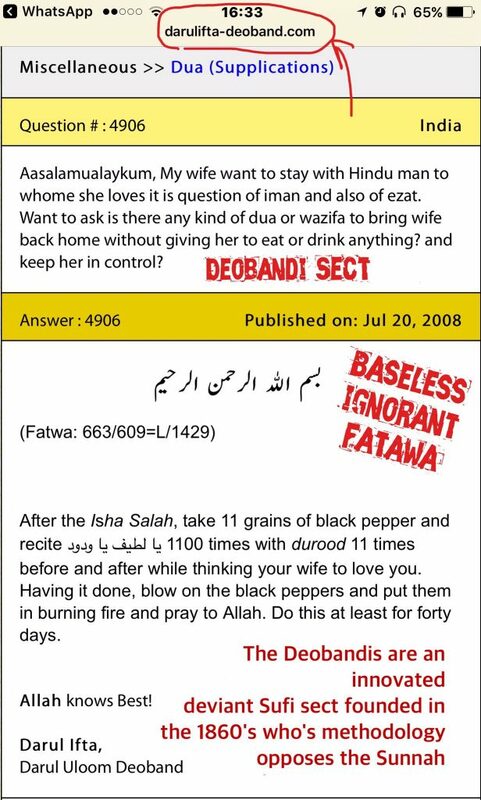 The Deobandis are fanatical Māturīdis in belief, Hanafis in Fiqh (i.e. in outward duties) and Sufis in worship with the esoteric disciple-to-sheikh relationships. For photographic evidence see: www.abukhadeejah.com/wp-content/uploads/2018/07/grave-of-muhammad-ilyas-tableegh-tabligh.pdf and At-Tuwayjiri, p.12. Reported by Abu Hātim, Ahmad 1/405 (38844), Al-Albāni in Tahdīr as-Sājid, p. 23, it is authentic. In English, refer to “Fadhaail-e-Durood – Virtues of Salaat and Salaam” (PDF) translated by Moulana Irfan Adalat, Darul-Uloom, Bury, UK. In Urdu, refer to “Faza’il-e-A’maal”, published by Idara Irshaad-e-Diniaat Pvt. Ltd. Nizamuddin, No-13, Delhi, India. I have used the Urdu references as noted in a refutation posted on salafipublications.com, article ID, GRV020004. Incident (hikāyah) 35, p. 97 (Urdu); p. 169 (English). “Fadhaail-e-Durood”, chapter 8, p. 31 (English), Darul-Uloom, Bury. Final chapter of “Fadā’il Al-A’māl”, vol. 1, “Fadhaail-e-Durood” (English), p. 189, Darul-Uloom, Bury; “Faza’il-e-A’maal” (Urdu), p.109, Delhi, India. “Fadhaail-e-Durood” (English), incident 46, p. 185, Darul-Uloom, Bury; “Faza’il-e-A’maal” (Urdu), p.109, Delhi, India. Reported by Ibn Mājah and declared authenticate by Al-Albāni in Sahīh Al-Jāmī. Vol. 1, Hikāyat 50, p. 115 (Urdu), p. 199 (English). “Fadhaail-e-Durood”, Hikāyat 48, p. 110 (Urdu), p. 191 (English). “Fadhaail-e-Durood”, incident 48, p. 191 (English). Ref: Al-Mawāhib As-Sarmadiyyah, 133; Al-Anwār Al-Qudsiyyah, 137; Jāmi’ Al-Karamāt Al-Awliyā 1/146. See Haqā’iq Khatīrah Hawl At-Tarīqah An-Naqshbandiyyah. “Fadhaail-e-Durood”, incident 48, page 110 (Urdu), p. 190 (English). Reported by Bukhāri, 1965; Muslim, 1103.